Mattia Pasini (Italtrans Racing Team) topped the timesheets on Day 1 at Misano, on a roll at the end of FP2 taking over from compatriot Franco Morbidelli (EG 0,0 Marc VDS). 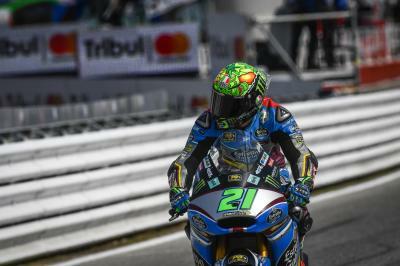 Morbidelli ended the day in second but only 0.065 back – with Silverstone winner Takaaki Nakagami (Idemitsu Honda Team Asia) completing the top three. One big headline of a different nature was the man quickest in FP1 – Alex Marquez (EG 0,0 Marc VDS) – who suffered a highside at the end of the first session and was subsequently declared unfit. The “Pistolas” will be gunning to get back on track at Aragon to defend his run of wins on home turf so far in 2017. 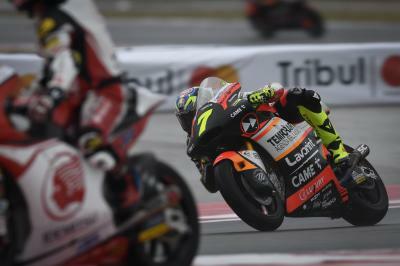 On the timesheets, that left Dominique Aegerter (Kiefer Racing) taking fourth, ahead of Red Bull KTM Ajo’s Miguel Oliveira to make it three chassis in the top five – Kalex, Suter and KTM. 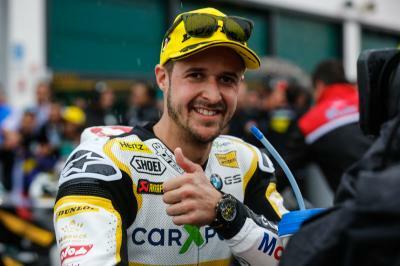 Championship challenger Tom Lüthi (CarXpert Interwetten) was sixth quickest and will be looking to move forward on Saturday as he fights to cut his 29 point deficit to Morbidelli. 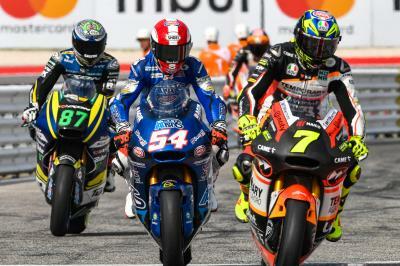 Francesco Bagnaia (Sky Racing Team VR46) was the fastest rookie on Day 1 at his second home race of the year, taking seventh after a more muted session in the morning. 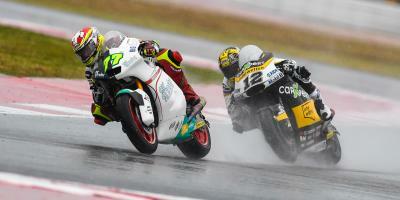 The rookie was only 0.002 seconds off Lüthi and edged out Simone Corsi (Speed Up Racing) by the same tiny margin – meaning Corsi ended Friday in P8. One crasher in the afternoon was Hafizh Syahrin (Petronas Raceline Malaysia), but the Malaysian was uninjured and ends Friday in ninth for a solid start. 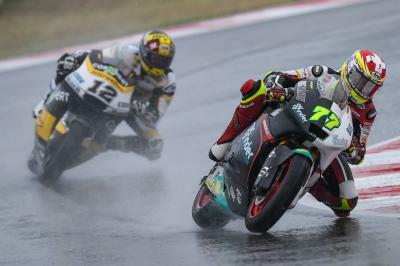 Misano winner last year, Lorenzo Baldassarri (Forward Racing Team) locked out the top ten. Stefano Manzi (Sky Racing Team VR46) backed up his impressive performance at Silverstone in P11, ahead of fellow rookie Jorge Navarro (Federal Oil Gresini Moto2), who crashed twice on Friday but rider ok. Luca Marini (Forward Racing Team) was P13, with Isaac Viñales (BE-A-VIP SAG Team) and Axel Pons (RW Racing GP) completing the fastest fifteen on Friday.